The shell of Ostrea gigas Thunberg, O. Talienwhanensis Crosse or O. rivularis Gould de of family Ostreidae. The O. Talienwhanensis is from the coastal maritime space of northern China, and the Ostrea gigas or O. rivularis are from coast area of China. Large, even, with clean and smooth inner side. 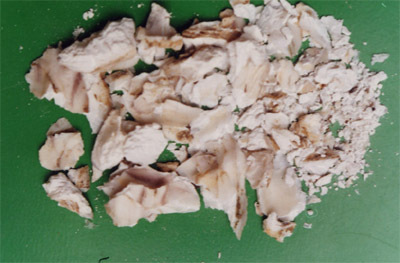 Flesh removed, washed, dried in the sun; unprocessed or calcined; smashed. Salty, astringent, slightly cold; liver and kidney meridians entered. Pacify liver and subdue yang, soften hardness and dissipate nodulation, astringe and arrest discharge. Being salty, cold in property and heavy, it has actions of pacifying liver and subduing yang, also with combining actions of clearing liver heat and nourishing liver yin to extinguish wind. For water failing to nourish wood, yin deficiency with yang hyperactivity manifested as dizziness, tinnitus, it is often combined with liver-pacifying, yang-subduing herbs and yin-nourishing herbs. For instance, it is combined with Gui Jia, Long Gu and Bai Shao in Zhen Gan Xi Feng Tang from Yi Xue Zhong Zhong Can Xi Lu. For limbs spasm due to long time heat disease consumed genuine yin with stirring of deficient endogenous wind, it is often combined with yin-nourishing and yang-subduing herbs. For instance, it is combined with Gui Jia, Bie Jia and Bai Shao, etc, in Da Ding Feng Zhu from Wen Bing Tiao Bian. It can soften hardness and dissipate nodulation. For phlegm nodule, scrofula due to stagnation of phlegm fire, it is often combined with phlegm-resolving and heat-clearing herbs and hardness-softening and nodulation-dissipating herbs. For instance, it is combined with Zhe Bei Mu and Xuan Shen and so on, in Xiao Luo Wan from Yi Xue Xin Wu. For mass due to qi stagnation and blood stasis, it is often combined with qi-moving and blood-activating herbs, shch as E Zhu, San Leng and Bie Jia and so on. It has similar actions to calcined Long Gu in astringing and arresting discharge. It is indicated for kinds of syndromes of incontinence due to healthy qi deficiency, mutually reinforced by Long Gu, and often combined with tonifying herbs and astringent herbs. For spontaneous sweating or night sweat, it can be used singly in powder for external application. For spontaneous sweating or night sweat, it is also combined with qi-nourishing and superficies-strengthening anhidrotic herbs, such as Huang Qi, Fu Xiao Mai and Ma Huang Gen, etc. For spontaneous sweating or night sweat, it is often combined with yin-nourishing and fire-clearing herbs to reinforce the action, such as Sheng Di Huang, Bai Shao and Zhi Mu, etc. For emission and spermatorrhea due to kidney deficiency, it is often combined with kidney-tonifying and essence-securing herbs, such as Sha Yuan Zi and Qian Shi, etc. For enuresis and frequent micturition, it is often combined with urination-reducing herbs, such as Sang Piao Xiao, Jin Ying Zi and Ji Nei Jin and so on. For metrorrhagia and metrostaxis and leukorrhagia, it is often combined with kidney-tonifying, metrorrhagia-arresting and leukorrhagia-stopping herbs, such as Qian Shi and Hai Piao Xiao, etc. In addition, it can absorb acidity and alleviate pain after calcined. It can be indicated for stomach and sour regurgitation, combined with Hai Piao Xiao and Zhe Bei Mu in powder for oral taking. Decoct 15~30 g. Smash and decoct first. Orally take in powder or pills 1~3 g. Take proper dose for external application. Take calcined one for astringing discharge, absorbing acidity and alleviating pain, while take the unprocessed one for the others.